US equity futures are flat, following a drop in Asian shares and modest rise in European equities as markets digested the late Wednesday news that Trump's administration started a Section 232 trade probe that may lead to new U.S. tariffs of as much as 25% on new imported vehicles, restarting global trade wars and weighing on Japanese and European automakers. Trump’s push for tariffs drew pointed responses from Japan and South Korea and ended the temporary calm that came less than a week ago when the U.S. and China declared a truce in their trade dispute. S&P futures were unchanged while the tech sector rallied as Nasdaq futures break through yesterday’s session highs. Offsetting concerns about Trump's auto tariffs was a Bloomberg report that China is said to plan to cut tariffs on consumer goods, effective July 1st, on everything from cosmetics to food. As Bloomberg notes, it has "already been a torrid week across markets so far, with investors forced to navigate escalating geopolitical and trade risks, from Trump’s decision to back away from an agreement with China to North Korea warning of a “nuclear-to-nuclear showdown.” Questions are swirling around the Italian populist government’s economic policies, while Brexit negotiations loom large over British assets. Amid the noise, the impact of somewhat dovish minutes from the Federal Reserve appeared to fade." European stocks started flat, dragged lower by automakers in response to Trump's proposed tariffs, but then advanced after the ECB’s Peter Praet said in Brussels that economic conditions are good despite clouds. Stoxx Europe 600 Index climbed 0.3% to session high, extending earlier gains, with 15 of 19 industry groups up. Shares of technology, chemicals and retail companies gained the most, while European carmakers fell, with the Stoxx 600 Automobiles & Parts Index down 1.9% and underperforming the broader gauge. Earlier, Trump's tariff report also dragged the MSCI Asia Pacific Index lower, although modestly so, and led by Japan where the stronger yen was the primary reason for equity weakness. The Nikkei 225 (-1.1%) was the underperformer as currency strength sapped exporter sentiment and with automakers reeling from the prospects of the hefty import duties, while ASX 200 (unch) was pressured by financials amid the ongoing banking royal commission grilling on the sector, although losses in the index were stemmed by strength in consumer stocks. Elsewhere, Shanghai Comp. (-0.5%) and Hang Seng (+0.3%) traded mixed following a net neutral liquidity operation by the PBoC and mixed signals on trade talks from President Trump who stated discussions are moving along nicely, but then suggested a change in the structure may be needed. The recent return of apparent calm to the market surface belies what is a return of many of the recent risks back to the forefront: "All the risk factors which had been pushed to the back are returning to the fore: uncertainty over U.S.-North Korea talk, U.S.-China trade tension, the Italian political situation as well as concerns about euro-zone growth," Kumiko Ishikawa, an FX analyst at Sony Financial in Tokyo told Bloomberg. Peripheral European bonds advanced, including Italy’s, on a La Stampa report that Luigi Zingales and Geminello Alvi are other possible candidates for Italian Finance Minister apart from favored eurosceptic Savona, whose name has spooked Italian bonds in recent days. Treasuries slipped, and after closing just under 3.0% on Wednesday, the yield on 10-year TSYs rose on Thursday and stabilizes around 3% after earlier touching their lowest level in ten days. In global macro, the dollar weakened against most G-10 peers after Wednesday’s dovish Fed minutes and concerns about trade tensions between the U.S. and Asian economies increased. The BBDXY fell 0.1% to 1168 and the yen strengthened for a third day as Japanese stocks slumped on concern Trump's probe of U.S. car and truck imports will lead to the introduction of higher auto tariffs: USDJPY fell as much as 0.6% to 109.38, while Japan’s Nikkei 225 dropped 1.1%. Asia was also spooked as the recent diplomatic achievements between Trump and Kim appeared to unravel after North Korea reiterated a threat to cancel a planned June summit with the U.S., further boosting demand for haven assets. Commodities were mixed as markets focus on US President Trump’s protectionist policies. WTI crude (-0.7%) and Brent (-0.8%) continue to extend losses alongside the lacklustre risk tone and following the prior day’s surprise DoE crude inventory build. Expectations that OPEC could boost output to offset the supply disruptions caused by Iran and Venezuela remain on traders’ minds. Meanwhile, gold (+0.5%) continues to creep higher as the yellow metal tracks the softer dollar. Elsewhere, Shanghai copper prices snapped a five-day winning streak and closed lower amid Trump stating that any deal with China will “need a different structure”. On the flip side, Chinese steel and iron ore futures closed higher, snapping its 7-day losing streak. In other overnight news, the Times reported UK PM May is to ask EU for a new Brexit transition to last until 2023 to avoid a hard border. This was then dismissed by dismissed by government sources. Mexico NAFTA negotiator said a skinny NAFTA deal is not an option and that they are not interested in a partial agreement. Late on Wednesday, US President Trump said he will know by next week if the summit with North Korea on June 12th will go ahead. In related news, North Korea said it condemns comments from US Vice-President Pence that North Korea may end up like Libya, while a Foreign Ministry official stated they will suggest to North Korea’s leadership to reconsider summit and that summit is entirely up to Washington. Elsewhere, US Ambassador to Israel said the White House Middle East peace plan could be unveiled within next few months. Also overnight, the US expelled 2 Venezuelan diplomats in which they were ordered to leave in 48 hours. In central bank news, ECB's Praet says economic conditions are good despite clouds; ECB's Vasiliauskas doesn't disagree with ECB's rate hike forecasts in six months. Over in Japan, BoJ board member Sakurai says it’s too early to mull withdrawal of stimulus and now is the time to watch data carefully; he adds all policy options must be looked at when considering modifying policy. Asian equity markets traded subdued with Trump’s trade policies returning to the forefront of attention after the US President ordered the Commerce Department to consider a probe on auto imports for national security purposes under Section 232, while reports also noted that tariffs of as much as 25% are being considered and is likely an attempt to prod NAFTA counterparts for a better deal. In addition, increasing uncertainty whether the US-North Korea summit will take place added to dampened tone, which in turn has collectively overshadowed a slightly-dovish perceived FOMC minutes. Nikkei 225 (-1.1%) was the underperformer as currency strength sapped exporter sentiment and with automakers reeling from the prospects of the hefty import duties, while ASX 200 (-0.1%) was led lower by financials amid the ongoing banking royal commission grilling on the sector, although broader losses in the index were stemmed by strength in consumer stocks. Elsewhere, Shanghai Comp. (-0.5%) and Hang Seng (+0.3) traded indecisive following a net neutral liquidity operation by the PBoC and mixed signals on trade talks from President Trump who stated discussions are moving along nicely, but then suggested a change in the structure may be needed. Finally, 10yr JGBs were flat despite the underperformance seen in Japanese stocks, as prices took a breather from the prior day’s gains and with weaker demand seen in today’s enhanced-liquidity auction for 10yr-30yr JGBs. China Mofcom said it will encourage companies to import more from US and that it welcomes US sending officials to China, although it reiterated that China has not promised to reduce trade deficit by a certain amount and will unswervingly protect its interests. European bourses are currently positive (Euro Stoxx 50 +0.4%) with the current outperformer, the IBEX (+0.5%). FTSE 100 (-0.1%) is currently the underperforming bourse amid GBP strength post- Retail Sales. Auto names are being hit by the US import probe, with names such as Daimler (-2.9%), BMW (-2.8%), Volkswagen (-2.8%) and Peugeot (-2.1%) affected negatively by this news. In the M&A scope, the touted Barclays/Standard Chartered merger is stated to have created a rift between Barclays’ chief executive and chairman. Elsewhere, for Smurfit Kappa, a group of shareholders at the co. have asked the company to enter into talks with International Paper. However, the Smurfit board later reaffirmed their position against the deal. FX markets thus far are trading in a more relaxed fashion compared to yesterday’s sizeable moves seen in the early stages of European trade. Most majors are sticking to their recent ranges with the USD back below 94.00 (DXY -0.2%) in the wake of yesterday’s FOMC minutes release which was perceived as a tad dovish and did little to change the current ‘gradual hikes’ backdrop, while it also indicated the Fed would tolerate inflation temporarily above 2% and that there was a range of views on how many rate hikes are required. USD/JPY remains a key focus for the market with the JPY broadly firmer against its major peers (albeit off best levels) with the major pair sitting just above 109.50 after the move to the downside ran out of steam ahead of the 30DMA seen at 109.20. Elsewhere, the EUR has also been a beneficiary from the softer USD with EUR/USD reclaiming the 1.1700 handle after yesterday’s data-inspired rout with traders mindful over today’s ECB minutes release which will look to see if the official account of proceedings corroborates with Draghi’s vague overview of proceedings which left investors unclear as to what the ECB actually discussed at the meeting. Finally, the TRY has pared around half of its gains seen against the USD yesterday after the CBRT held an extraordinary meeting to evaluate recent developments in which it raised the Late Liquidity Window (the lending rate) by 300bps to 16.50%, while it added that it will use strong monetary tightening to support price stability. Given the price action in recent trade, it appears that markets still cast serious doubts over the autonomy of the CBRT and whether attempts to defy Erdogan will be sustainable in the long-term ahead of domestic elections next month. Commodities are mixed as markets focus on US President Trump’s protectionist policies. WTI crude (-0.7%) and Brent (-0.8%) continue to extend losses alongside the lacklustre risk tone and following the prior day’s surprise DoE crude inventory build. Expectations that OPEC could boost output to offset the supply disruptions caused by Iran and Venezuela remain on traders’ minds. Meanwhile, gold (+0.5%) continues to creep higher as the yellow metal tracks the softer dollar. Elsewhere, Shanghai copper prices snapped a five-day winning streak and closed lower amid Trump stating that any deal with China will “need a different structure”. On the flip side, Chinese steel and iron ore futures closed higher, snapping its 7-day losing streak. Russian Energy Novak says that gradual oil output recovery will be discussed in June. Looking at the day ahead, we get weekly initial jobless claims, Q1 house price purchase index, March FHFA house price index, April existing home sales and the May Kansas City Fed PMI are all due. Over at the Fed, Dudley will speak in the morning, along with BoE Governor Carney, while in the evening Harker is due to speak again. It's worth noting that Russia's acting energy minister is due to discuss the US exit from the Iran accord with Saudi Arabia's energy minister on Thursday. The ECB will also publish its Financial Stability review report while the ECB’s Praet will speak shortly after. I don’t know about you but it’s hard to get work done at the moment without the constant ping of an email about GDPR. Companies that I only hear from once every few weeks are suddenly sending me daily emails pleading to opt in before tomorrow’s deadline. The only ones I’ve accepted so far are one that promises to cut my golf handicap and one that might be able to get me Champions League Final flights to Kiev for Saturday. Of the two I’m not sure which is the more realistic. Markets were as erratic as my golf game yesterday, especially in Europe as the Euro PMIs disappointed, North Korea and Italy continued to focus everyone’s minds and the Turkish lira was on course for its worst day since October 2008 as it fell around -5.5% intra-day and to the lowest level on record. However the day was partly rescued first by an after the European close emergency meeting by the Turkish Central Bank where they raised their “late liquidity window” rate 300bps to 16.5% and then by the perception of a slightly dovish set of Fed minutes. The Turkish Lira saw a huge turnaround and was up 1.99% on the day at the end of the US trading session. For background, the Turkish Lira has fallen -20.5% this year and -12.7% in May alone as Erdogan has threatened to take more control of monetary policy if successful in an upcoming election. YTD the Lira is only behind the Argentinian Peso which is down -31.5% in 2018. Our FX strategists made a good point last night in a blog where they argued that every Fed tightening cycle creates a meaningful crisis somewhere and it backs up a point we made in last year’s "The next financial crisis" The blog last night noted that going back in history, the 2004-6 Fed tightening created the US housing collapse and the catalyst for the global financial crisis. The late 1990s Fed stop start tightening cycle included the Asia crisis, LTCM and Russia collapse, and when tightening resumed, the pop of the equity bubble. The early 1993-4 tightening phase included the bond market turmoil and the Mexican crisis. The late 1980s tightening ushered along the S&L crisis. Greenspan’s first fumbled tightening in 1987 helped trigger Black Monday, before the Fed eased and ‘the Greenspan put’ took off in earnest. The early 80s included the LDC/Latam debt crisis and Conti Illinois collapse. The 1970s stagflation tightening was when the Fed was behind ‘the curve’ and where inflation masked a prolonged decline in real asset prices. A reminder that our note from last September suggested that financial crises have been a very regular feature of the post-Bretton Woods system (1971-) and that based on history we’d be stunned if we didn’t have another one in some form or another by around the end of this decade/turn of the next one. The most likely catalyst was the “great unwind” of loose monetary policy/QE around the world at a time of still record debt levels. We would stand by this and I suppose the newsflow and events this year so far makes me more confident of this even if we’re still unsure on the timing or the epicentre. Back to yesterday, the slightly dovish Fed minutes seemed to help the S&P 500 to reversed earlier losses to close in positive territory for the day (+0.32%). Our US economists believes the minutes indicated that a further rate hike should be expected in June but that the Committee is not in a rush to clearly signal a more hawkish trajectory at this juncture. In the details, the minutes noted that “most participants judged that….it would likely soon be appropriate…to take another step in removing policy accommodation”. On balance, the minutes didn’t seemed to be too concerned about an overheating economy and inflation over shooting. It noted that a temporary period of inflation “modestly above 2% would be consistent with the committee’s symmetric inflation objective…” and that “it was premature to conclude that inflation would remain at levels around 2%....” On the labour market, the minutes noted the Employment cost index for 1Q indicated the strength in the labour market was “…showing through to a gradual pickup in wage increases, although the signal from other wage measures was less clear.” while many participants commented that overall wage pressures were still moderate or were strong only in industries and occupations…” Overall, given our economists’ expectations for the ongoing tightening of the labour market, they still expect three more hikes this year. This morning in Asia, markets are broadly lower with the Nikkei (-1.23%), Kospi (-0.27%) and Shanghai Comp. (-0.04%) all down while the Hang Seng is rebounding modestly (+0.07%). In the US, President Trump has ordered the Commerce Department to investigate whether car and truck imports threaten national security, to which Bloomberg cited unnamed sources that suggest these investigations under Section 232 could lead to higher tariffs. Back in early May, Trump told US car markers he was planning to impose tariffs of 20-25% on some imported vehicles. Elsewhere, the Secretary of State Pompeo seemed to be easing his demands on North Korea, now calling for the regime to take “credible steps” towards denuclearisation rather than give up its weapons program immediately. Now recapping other markets performance from yesterday. European equities were all lower, weighed down by softer PMIs, Italian politics and rising US / China trade tensions. Across the region, the DAX (-1.47%), FTSE (-1.13%) and Stoxx 600 (-1.10%) were all down, although the latter is still up 0.9% on an YTD basis. Elsewhere, the VStoxx jumped 16.0% to 15.06 and has been back above the VIX (12.58) for three out of the last four trading sessions after a few months of mostly being below. Despite the softer European session, US bourses turned around to close modestly higher after the FOMC minutes (S&P +0.32%; Dow +0.21%; Nasdaq +0.64%). In the retail space, Target dropped -5.7% post poor results, but Tiffany & Co. (+23.3%) and Ralph Lauren (+14.3%) rallied post a beat on earnings. Following on, government bonds rallied following the dovish FOMC minutes and softer than expected PMIs. The yield on UST 10y fell below 3% (-6.7bp to 2.994%), while Bunds (-5.3bp) and Gilts (-8.4bp) also declined, with the latter’s outperformance partly due to a softer than expected core CPI print for April. Meanwhile, Italian BTPs resumed their slide (10y +7.2bp) as the Italian President Mattarella named law professor Giuseppe Conte as the new PM, who will now start the process of forming a new government. Mr Conte said he “is aware of the need to confirm Italy’s position in Europe” but added that his government will based on the accord agreed by the 5SM and League Party. Elsewhere, WTI oil nudged down -0.50% to $71.84/bbl while precious metals were little changed. Before we take a look at today’s calendar, we wrap up with other data releases from yesterday. In the US, the flash May PMIs were above market with the composite PMI at 55.7 (vs. 54.9 previous) while the services (55.7 vs. 55 expected) and manufacturing (56.6 vs. 56.5 expected) prints were also above expectations, with the latter at the highest in almost four years. Elsewhere, April new home sales fell -1.5% mom to 662k (vs. 680k expected). The number of properties for sale rose 12.4% yoy and the median sales price was little changed yoy. 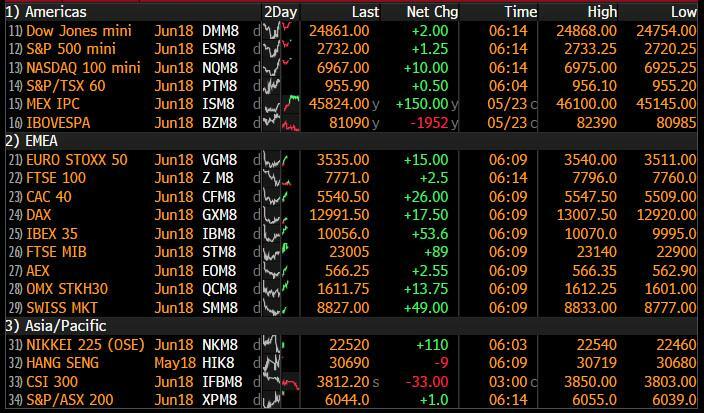 In Europe, the May flash PMIs were broadly below expectations and helping to cause the market weakness in the European session. The Euro area’s Composite PMI was 1pt below consensus at 54.1 (vs. 55.1) and the lowest reading in 18 months, while the services (53.9 vs. 54.7 expected) and manufacturing (55.5 vs. 56.1 expected) prints also disappointed. Across the region, all three of Germany’s PMIs were below expectations while France’s manufacturing PMI was modestly above. For composite PMIs, Germany was 53.1 (vs. 54.6 expected) while France was 54.5 (vs. 56.8 expected). DB’s Peter Sidorov noted the data point to a softening in external demand but beyond that, the mixed details do not offer much clarity and consistency in terms of the direction or drivers of the cycle after the Q1 surprise. Growth remains above trend but the murky data will make the ECB’s approaching QE decision more complex. Elsewhere, the Euro zone’s May consumer confidence was below market but remains relatively sound at 0.2 (vs. 0.5 expected) while France’s 1Q unemployment rate was 8.9% (vs. 8.5% expected). In the UK, the April CPI was 0.1ppt lower than expectations with headline CPI at 0.4% mom (vs. 0.5% expected) and core CPI down to a 13-month low of 2.1% yoy (vs 2.2% expected). The weakness was partly due to the timing of Easter and lower inflation for airfares. Meanwhile, RPI was in line at 3.4% yoy while core PPI was above at 2.4% yoy (vs 2.1% expected). Looking at the day ahead, data due includes the final Q1 GDP revisions in Germany along with June consumer confidence, May confidence indicators in France and April retail sales data in the UK. In the US weekly initial jobless claims, Q1 house price purchase index, March FHFA house price index, April existing home sales and the May Kansas City Fed PMI are all due. Over at the Fed, Dudley will speak in the morning, along with BoE Governor Carney, while in the evening Harker is due to speak again. It's worth noting that Russia's acting energy minister is due to discuss the US exit from the Iran accord with Saudi Arabia's energy minister on Thursday. The ECB will also publish its Financial Stability review report while the ECB’s Praet will speak shortly after.